In this last session before we start putting faces on our characters, I’ll be introducing flexibility. Flexibility is the ability to stretch a joint to the limit of its range of movement, aka “how joints can and cannot move”. 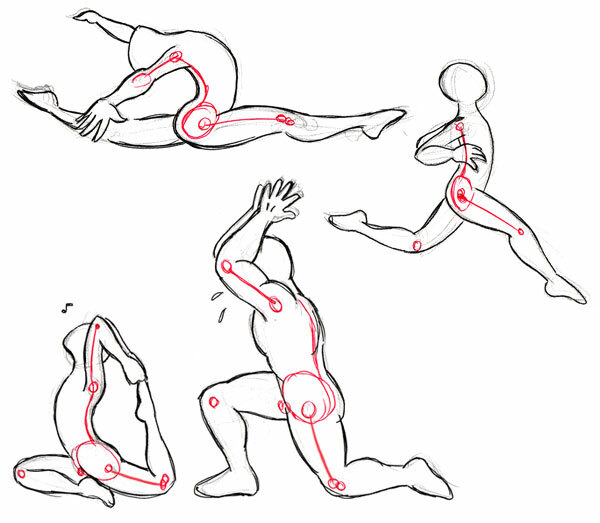 This material gathered from my own martial art and flexibility training is not frequently covered in books on drawing the human figure, but it complements the muscles in understanding the body in motion. It’s also necessary in order to articulate the body in a natural-looking way, rather than like a wooden manikin with screwed-on limbs! Before jumping into this, it’s worth keeping in mind some general flexibility facts which will help aid your learning. More muscles means less flexibility. Bodybuilders have the most limited range of movement for all the joints, first because they don’t stretch, second because the bulging muscles get in the way (remember Zangief in Street Fighter II?). only athletes and performers who follow power workouts as well as stretching routines (Wushu athletes, gymnasts) can have both muscle strength and flexibility, and their muscles are fine and sinewy, not bulging (think Bruce Lee). In daily life, something like cycling will also decrease leg flexibility if not balanced by just as much stretching. 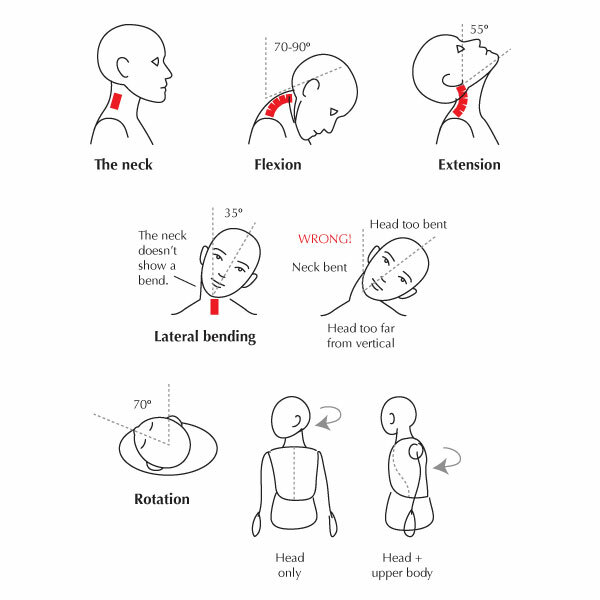 So it’s very common for people not to even have the range shown below – look for the parts of their body they use most, and you’ll know where they are most stiff. Some people who are exceptionally flexible, or double-jointed, or have undergone intensive flexibility training from a young age, and they can move beyond the range shown here. This in no way means it’s OK to ignore flexibility rules, as we all instinctively know what’s “normal” for a body and what’s exceptional. If you draw someone with limbs at an impossible angle, outside of a context that would allow suspension of disbelief (circus, gymnastics, the Exorcist), you risk coming across as a poor artist. Dynamic flexibility is how much you can stretch using momentum to force the stretch, for instance swinging the leg. Doing so pushes it beyond what you could do either passively or actively, but only for a split second. This is what happens during fights or actions sequences because of the speed of the movements, so it’s quite appropriate to show extreme stretching in characters captured at the peak of the swing. In daily flexibility training, this can be used to gain more range – but the risk of tearing a muscle is very high and it must only be done after considerable warming up (absolutely do not try this at home). The neck corresponds to the last seven vertebrae in the spine (the cervicals). They are like stacked cylinders separated by a “cushion”, so their range of movement is limited. This “articulation” is made up of the five vertebrae that emerge from the pelvic bone. Its range of movement is quite limited, but, because we always use it allied to other stretches, it often looks as if it allowed considerable motion. 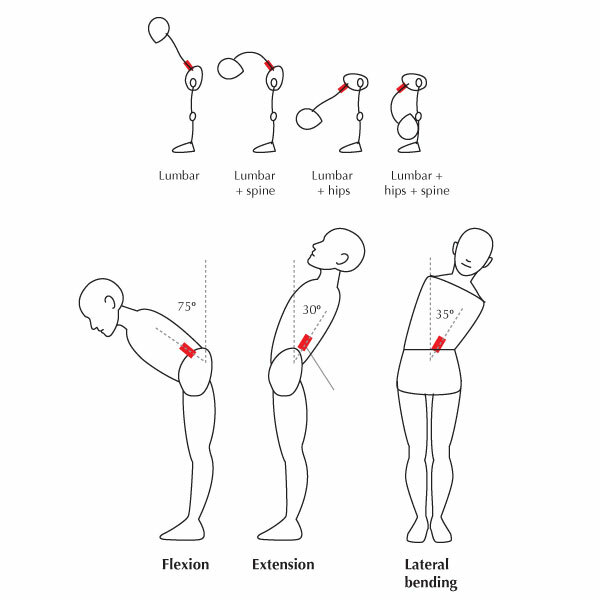 The diagram below shows how the involvement of other joints can make it look like the lumbar bending varies, but in fact it is the same in all four positions. Extension: Some people’s elbows overextend. Although not that uncommon, use discretion when representing it in drawing. It may look right on some characters and weird on others. Flexion: Don’t take it for granted that the joint can close all the way! This movement is impeded by muscle mass, and we should be able to feel this in a muscular character, as it conveys the muscular bulk (as opposed to soft fat). If not taken into account, it will make the muscles look insubstantial and wrong. 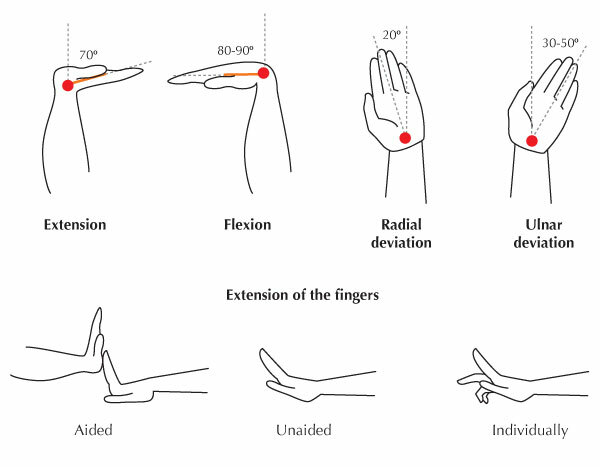 The wrist’s range of motion is almost all front and back; if you try to rotate it, you notice that it does not describe a proper circle, but more of an ellipse, because it can move so little to the sides. Fingers can be quite flexible as well when they bend back (extension). Aided, some people’s fingers can bend back up to 90º. Unaided, they can only extend a little and it requires much tension (occasionally using this in illustration gives the hand life and fluidity). They can also bend back individually, but if the rest of the hand is relaxed, the neighboring fingers will always be pulled up slightly by the lifted one. The hip is the key to leg splits, and, of course, to all kicks so essential to martial arts. 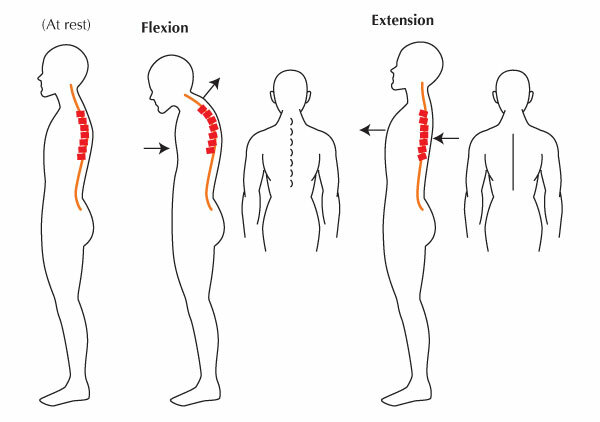 It is the lower body’s mirror of the shoulder as it is also a socket articulation, though more limited. Because of the way the joint works, a middle split with toes pointing forward is impossible! A middle split should have the toes pointing up. If someone seems to be doing the former, check out their back: it’s probably arched. This means they’re really doing a toes-up split, but the pelvic bone along with the legs and feet are tilted forward. 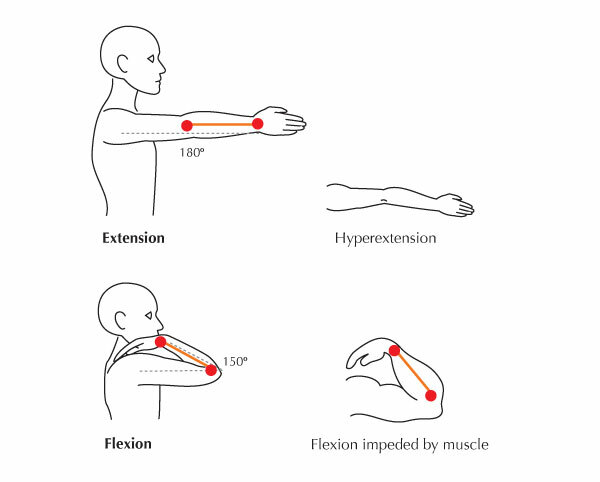 Flexion: Just as is the case in the elbow, muscles can impede the flexion. Someone with muscular legs won’t be able to sit on the heels this way. More muscles means sitting on the calves, the buttocks away from the heels. Extension: The knee doesn’t hyperextend! 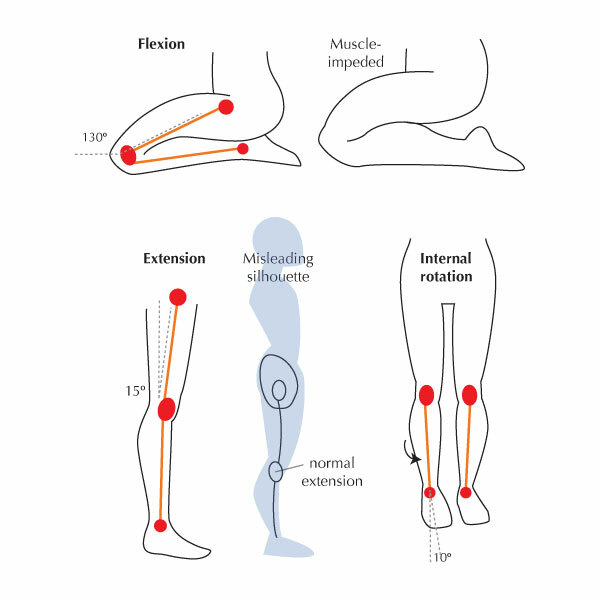 Exaggerated, sweeping leg silhouettes are due to the combined lines of the quadriceps and calf muscles that disguise the straight line of a normal extended knee. The thoracic spine was not included in the diagram of joints above, as it is not a joint and indeed included in most flexibility trainings. This part of the spine has very limited movement. Usage of it will make a character look particularly fluid (think Spiderman), but it’s easy to go too far and make them look like their back is broken! Don’t do this, the spine can’t bend this way! In the correct version, you can see that a number of joints engage so the body as a whole arches back. 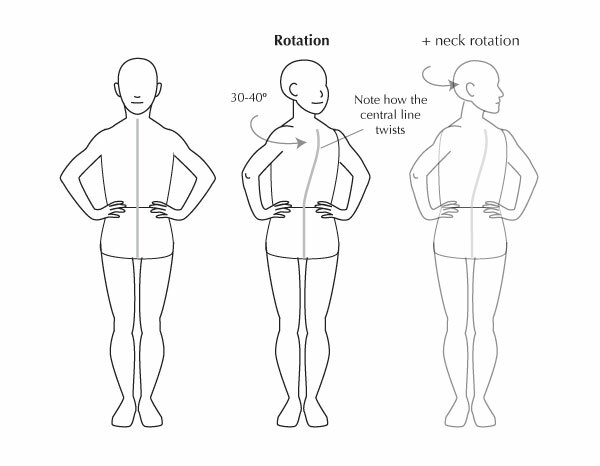 Rotation: Rotating the upper body means keeping the hips fixed and rotating only the rib cage left and right. only a small movement is possible this way, much smaller than if you allowed your hips to help. This ability is cultivated, for instance, in Taijiquan and belly dancing. The head can of course still turn further, but within the neck’s limits, so it can just reach 90º. Now that we understand how the individual joints stretch, let’s examine some actions that require several stretches together, so you can see how understanding the joints makes for more natural-looking poses. 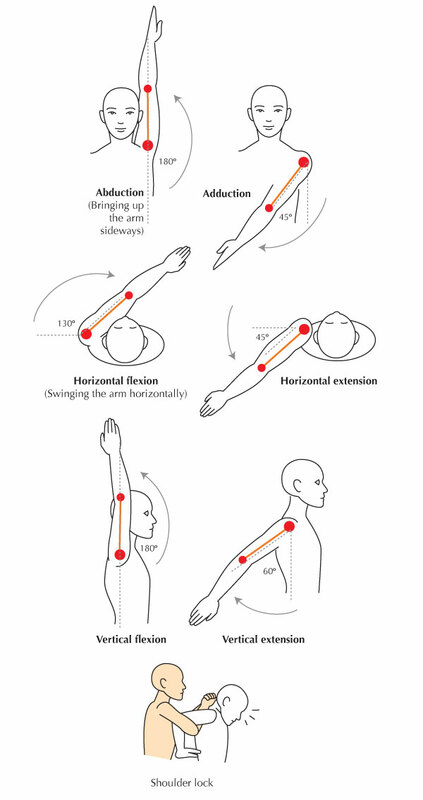 The red arrows indicate the joints where stretching occurs. 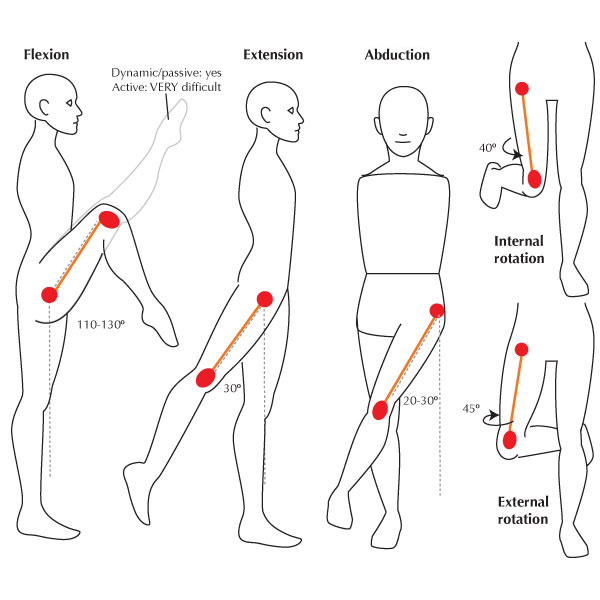 Below is the classic way, which is and the more difficult one, because the position of the knee demands more hip extension from the rear leg in order to “sit” completely on the ground. The knee of the rear leg is down and the sole of the foot up. Note that the front foot is always pointed if relaxed: flexing it would mean stretching the calf, which is a lot of extra effort. The other way below has the rear knee out with the toes pointing in the same direction. It’s a slightly easier position (easier on the knee as well), and favored in martial arts because it allows one to jump into a standing position (attempting to do so from a classic split would result in injury). 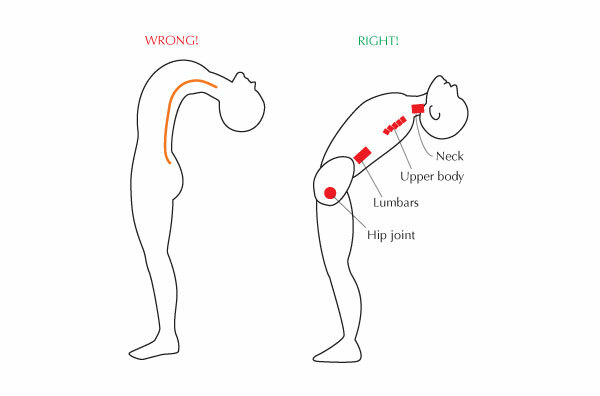 Wrong kick: All the joints involved have laterally limited range, and the body has to compensate by leaning sideways. This is so precarious, not only will he topple over sideways when his foot makes contact, but it’s also going to be a very weak kick because there’s nothing to draw power from. Low side kick: The “pure” side kick (watch those shins!) is used for low kicks and involves no stretching at all. 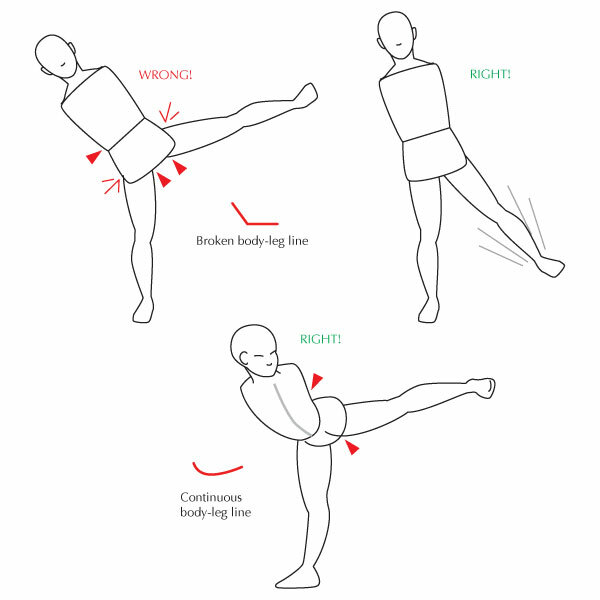 Correct, so-called side kick: This is closest to the frontal split, meaning the kick is actually directed backwards, using mostly a hip extension. This allows the body to take the form of a continuous arch firmly planted on the upright leg, which directs plenty of power into it. It only looks like a “side” kick because the upper body twists the way it does. A good bridge, where the feet and hands are distant by one forearm, requires almost all the joints to be extended. The heels push the ground so that the weight is mostly on the hands and the waist is pushed up – the only way to stretch the hip/lumbar areas enough. Elbows remain fully extended, or “locked”, but knees can’t be straight without widening the bridge, which doesn’t work as you quickly start slipping! certain I’ll learn many new stff right here! Best oof luk for the next! Hi there, You’ve done a fantastic job. I will certainly digg it and individually suggest to my friends.